The century from the 1880s -when was created the Italian colony of Eritrea and the first Italians moved to live there- until the 1980s -when started the war against Ethiopia for Eritrea's independence and the last Italian families went away- has seen the creation and development of the Italian schools in Asmara. Its best period coincided with the existence of the "Colonia primogenita", as was called Italian Eritrea in the 60 years of its existence (from 1881 to 1941). The first schools were those of the catholic missionaries, but in 1902 were officially created by the Italian government the first two elementary schools in Italian Eritrea, with two teachers from Italy: the first and main in Asmara and the second in Cheren (read http://www.scuoleasmara.it/scuola/scuola-coloniale.html ). During colonial times most of the students were Italians, but after WW2 the number of Eritrean students has increased: in 1956 they were 17% of the students (while the Italians were 83%), while in 2015 they were nearly all. 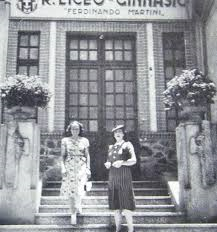 The highest-level institution was the Italian Lyceum "Ferdinando Martini" in Eritrea's capital, that was founded in 1926 and in 1935 was named "Liceo Scientifico" (while in 1937 the name was changed to "Liceo Classico") with nearly all the students coming from the Italian community of Asmara: it was returned to be a scientific Lyceum only in 1956, when nearly half of the students were Eritreans. Actually (2014) there are 330 students: 85% are Eritreans and 13% are from other countries, while just a few are italians. Historian Giulia Barrera wrote that in 1940 there were in Eritrea 75,000 Italian civilians (while the total of Italians reached 100,000 persons when added the military men): 59,000 were male and 16,000 female. Nearly 20,000 children were born from them during colonial times, so the total attendance in those decades to the Italian schools was probably around 30,000 because we have to add the numerous descendants from relationships between Italian soldiers and Eritrean native girls. However the "mixed race" Italo-eritreans went in large numbers even to the schools -reserved by Fascism's racial segregation in the late 1930s- for the native Eritreans. Indeed, according to Matteo Pretelli (in his "Education in the Italian colonies during the interwar period" of the University of Trieste) in the very first years of Italian rule in Eritrea education was not a priority. The first Italians in the area were soldiers barely interested in educating the indigenous population, beyond having "Askaris" – local troops enrolled in the Italian forces – taught the Italian language (all native battalions had their own educational courses for Askaris and their sons). The Italian colonies in East Africa had limited numbers of settlers to begin with, and, according to observers at the time, it was very difficult to recruit teachers from Italy as they rarely welcomed the move to a tropical climate. )- usually played a leading role in the Italian colonial development and the related educational system. They often maintained good relationships with the colonial authorities, which delegated most of the educational work to them. Even before Fascism, missionaries in Italy’s African possessions were in many instances aligned with the government. In 1923, the new Fascist administration officially consigned all education in Eritrea to the Congregation of Santa Anna. Even French and Swedish missionaries retained a significant role until they were sent away during the invasion of Ethiopia in 1935. Eritrea's Governor Marquis Giuseppe Salvago Raggi (1907–1915) believed that the purpose of education was to train a local elite for posts in the colonial administration. A school for the children of Muslim leaders and notables was therefore established in Keren in 1911 to train students for employment in the telegraph and mail services. In 1921, a "Regio Decreto" established an educational system for the Eritrean native population which consisted of primary schools, schools teaching craft skills, and a type of technical secondary school in Asmara. Consequently, most government and state-recognised schools focused on farming and skilled manual work, some other schools focused to train a small number of interpreters, artisans and accountants and a few schools to train people for administrative posts. However Pretelli pinpointed that it was sometimes hard to convince African students to attend classes regularly, as they usually left as soon as they had learnt the few Italian words that allowed them to be employed as basic interpreters or maids. After the 1923 "Riforma Gentile" in Asmara were created 3 high schools: the "Liceo Martini", the "Istituto Tecnico Bottego", and in the late 1930s the "Istituto Magistrale". On the eve of the war on Ethiopia in 1935, native schools in Eritrea enrolled 3194 students including 59 of mixed race, while there were 196 mixed race children in schools for Italians. At that point, almost all the Italian and Eritrean students were members of Fascist youth organizations (mainly the "Gioventu italiana del Littorio"). The fascist Italian regime also banned high educational opportunity for Eritrean citizens, and access to education was limited only up to Grade 5 in order to train some translators, writers and servants. This move mainly emanated from a threat that educated Eritreans would arouse the general public to oppose the Italian colonial rule. The height of this kind of segregation in education was reached after enactment of the 1937 race legislation ("Leggi razziali"), following Mussolini's alliance with Hitler. and a few dozen old colonists). However until 1947 under British rule the only language used in all the Eritrean schools was the Italian language (with the exception of the few religious schools for Muslims). <<.......The period from the end of the Second World War to the Derg’s uprising in 1975 represented a distinctive phase of the Italian presence in Eritrea. These years are indeed remembered as a golden era for the approximately more than 10,000 Italians still living in Asmara. No longer the colonial rulers, they assumed instead the role of a white elite and occupied an hegemonic socio-economic and cultural position in the country. From a cultural perspective, these years represented a highly speciﬁc phase in the construction of both Eritrean and Italian national discourses about the colonial past. From an Italian perspective this involved a failure to acknowledge colonial problems, whilst from an Eritrean perspective, this involved highlighting colonial legacies for autonomist discourses. Italian schools were established in Eritrea during the Italian expansion and had diﬀerent functions during the colonial period. These included supporting Italian Catholic evangelization, providing shelter to Italo-Eritrean children abandoned as a result of Mussolini’s Racial Laws and educating the children of Italian colonial settlers and oﬃcers. In contrast to what had happened in other colonial regimes, Italian schooling was not originally directed at ‘indigenous’ children. The latter were excluded from education until 1934 and even then most of them could not study past the fourth grade, while the best could do a "Corso biennale di perfezionamento" (2 years improvement course). 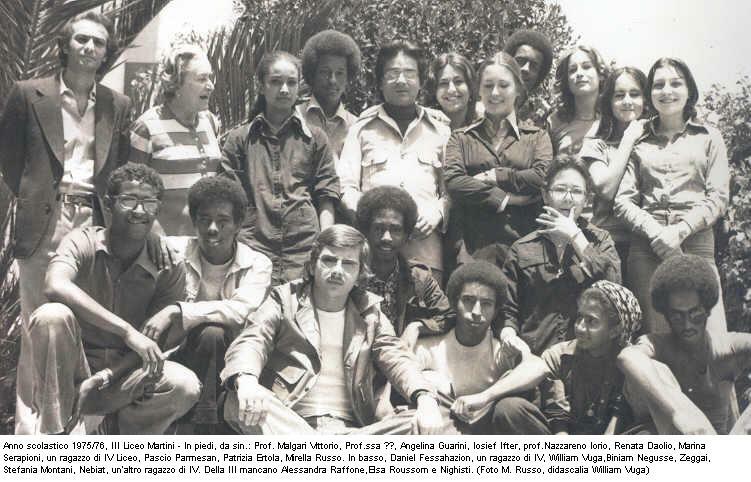 After an initial crisis at the end of the colonial period when many Italians left Eritrea, these schools began to acquire new popularity from the late 1940s. A still conspicuous number of Italians (diﬀerentiated by generational settlement in Eritrea) attended them, while the number of Eritrean and Italo-Eritrean pupils gradually increased. In our view, this revitalization of Italian schools and the increase in Eritrean children’s enrolment in them can be attributed to a range of factors. One factor was the general rise in schooling for Eritrean children under the British protectorate and the Ethiopian (federal) administration, which stressed the importance of education for the development of the country. A more important factor was the signiﬁcant presence of Italian ﬁrms, factories, banks, missions, shops, and trade relationships with Italy, which made several Eritrean families consider it advantageous to provide their children with Italian language skills. Moreover, in some cases, Italian or Italo-Eritrean adults in the family (aunts, uncles or adoptive parents) might have pushed for an italianization of their children, in cultural and religious terms. In the light of these factors, we see the enrolment of Eritrean children in Italian schools as embedded in the hegemonic character of the Italian postcolonial socio-economic and cultural presence in the city of Asmara. From the end of the 1940s until the mid-1970s the composition of these school classes evolved in terms of gender, class, ethnicity and religion. In order to provide a suggestive image, we reproduce here a selection of photographs from the website of the organization ‘Il Chichingiolo’ (see Album fotografico ). This is a well-known ‘place of encounter’ between people – mostly Italians – who used to live in Eritrea. The photographs show how, over time, the percentage of black pupils who might have been Eritreans or Italo-Eritreans increased to the point of representing a signiﬁcant number at the high school level, in the 1970s. Yet Italian children were in many cases the majority. In the case of boarding schools, on the other hand, we know that the residents were mainly Eritrean or Italo-Eritrean children of working or migrant parents who felt compelled to leave their children there. 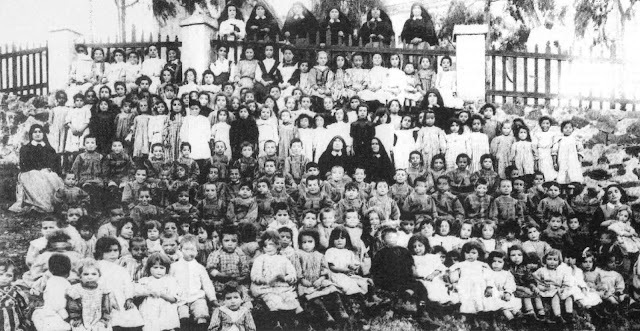 The most important Italian schools in Asmara were the following: religious elementary schools initially run by the Daughters of Saint Anna from 1895, while successively managed by the Combonian Sisters Pia della Nigrizia from 1938 (called ‘Istituto Sacra Famiglia’) and by the La Salle Christian Brothers from 1938 (for boys only). The ‘Daniele Comboni’ school was a British school (originally Italian) that ran an Italian section from the late 1940s. To these, we have to add the girls’ boarding school ‘Villaggio Paradiso’ opened by the Ursulines Sisters in 1949 and finally the Italian State Schools, which ran from elementary to high school with specializations in accountancy, surveying, trade and science. After WW2 the elementary school originally served only preschool and grades one to five, but in 1957 added a "Montessori school", which served ages three to five. In 1975, the school ceased most operations due to the breakout of the Eritrean War of Independence, and most of the Italian community left. By 1990, the Montessori school grew to 3 teachers and 4 classes. In 2000, Italy recognized the school, arranging an agreement that the school be accessible to all temporary expatriate families for low cost. Today, 550 students attend this elementary school. Since 2002 there it is even a "Scuola Media" (Middle school) united to the elementary school as 'Istituto Italiano Comprensivo di Scuola Elementare e Scuola Media'. The "Lyceum" (founded in 1935 as "Liceo Martini" ) since 1986 has experienced changes in the teaching programs (with language, technical and professional sections) and is now called "Liceo Marconi": the actual 330 students are nearly all Eritreans. Finally it is noteworthy to remember that the "University of Asmara" was created by Italian religious organizations. Indeed The University of Asmara (UoA) was the nation's first university, and was founded in 1958 by the 'Piae Madres Nigritiae' (Comboni Sisters). The school was meant to provide for the local population, though its initial enrollment in the 1950s was entirely Italian. The university was founded with the name "Collegio Cattolico della Santa Famiglia": the roots were in the 1941 "Scuola di Medicina", linked to the Asmara Hospital (then named "Regina Elena"). In the early years, the curriculum reflected Italian educational plans, and courses were taught in Italian with a view to preparing students to receive the "laurea" (degree) from a university in Italy. In 1958, members of the missionary congregation 'Piae Madres Nigritiae' or Comboni Sisters began private education classes for 10 Italian female students. The "Holy Family University Institute" was founded by the Italian Sister Marianora and Sister Fosca with a few Ethiopian money and great determination. After opening with courses in modern Languages, Economics and Commerce, by 1960 they added Mathematics, Engineering and Architecture. 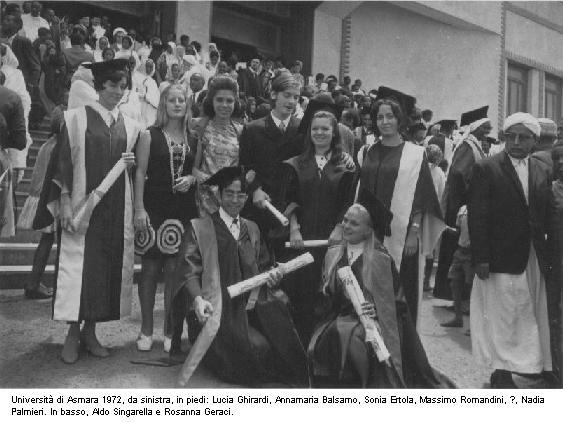 By 1964, the university had been renamed as "University of Asmara" and began offering Associate Diploma programs in the Arts, Commerce, and the Sciences. 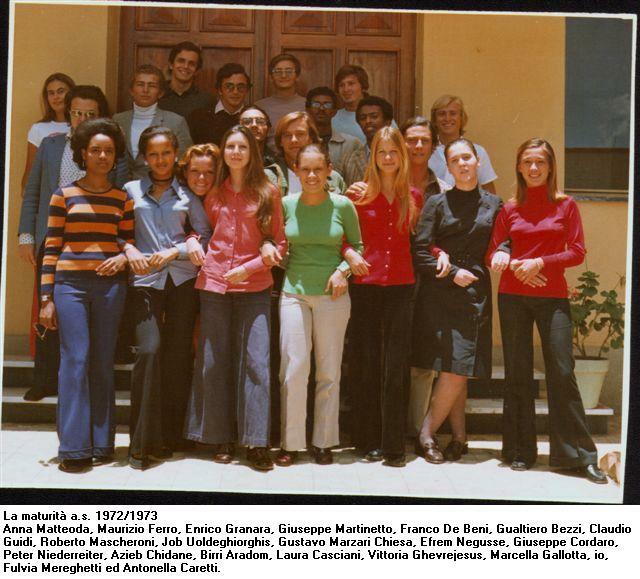 In 1968 half the students were Italians and the other half was made of Eritreans, Ethiopians and Africans. Good research! What about Italian schools in Mogadiscio?
. Asilo d’infanzia e scuola elementare parificata mista Regina Elena. • Missione cattolica dei cappuccini(scuola elementare parificata mista per italiani).